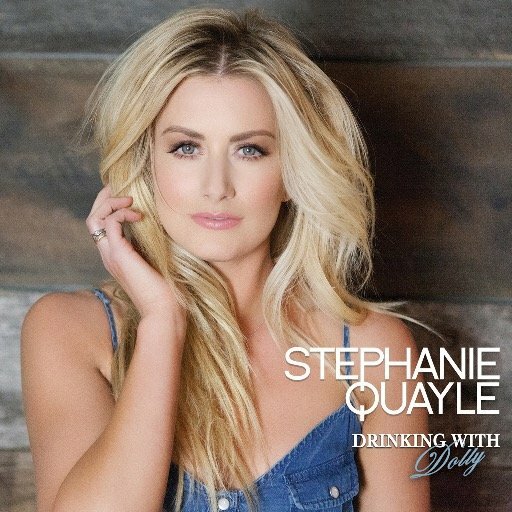 Stephanie Quayle releases new single Drinking With Dolly and we absolutley love it! Rising Country star Stephanie Quayle is an artist arriving on the scene of modern country music in impeccable timing. The vibrant blonde has a knack to captivate whether it be a stranger, a crowded room or a packed venue. From Quayle’s radiating energy and booming personality to the passion and intensity delivered in her music, the magnetic singer-songwriter grabs hold of an audience and doesn’t let go as she belts out her songs behind her guitar and piano. Quayle’s current single “Drinking With Dolly” is one close to her heart. It is an anthem for all the women of country in a time when female artists are rising together to make a major impact in today’s music scene. Quayle captures the heart of storytelling as she offers the genre a fresh sound, relatable storylines and an invigorating presence that is unmatched in today’s musical spectrum. Harnessing her signature passion and pairing it with an authentic artistry, fans can expect to hear and feel exactly what they didn’t know they were missing. Growing up on a working buffalo farm in Montana, Quayle spent much of her time out in the barn mucking horse stalls while listening to the local AM radio. This early introduction to country music sparked her fascination with handcrafted lyrics, artful storytelling, careful melodies, and a song’s ability to touch so many lives at one time. Before the launch of Quayle’s current project, singles “That’s What I’m Talking About” and “Sugar High,” impacted radio and CMT, GAC and ZUUS Country with the accompanying music videos. The Montana native’s career has taken her across the world performing on music stages alongside Jerrod Niemann, Jamie O’Neal and emerging artist Jon Pardi as well as the stages of the Sundance Film Festival, NRA and CMA Music Festival. Active in competitive equine and firearm sporting events, Quayle is a regular participant in charity events aligned with the heart of the country music lifestyle. Quayle’s journey as an artist has led her to this very moment in her career. She has found her voice and her sound. A perfect fit. A fit she has been piecing together all her life. Drinking with Dolly is the latest single from Stephanie Quayle and written by Victoria Banks and Rachel Proctor. It is a tribute to women in country music and is a song so many of us Country fans can relate to – as it is about being born in the wrong decade and if she could go back in time she would go Drinking with Dolly Parton, Tammy Wynette and Loretta Lynn and they would share stories, give advice and do all the things that women do. The songs southern sound, wonderful – fun lyrics and charming simplicity makes it the good song that it is. It is a mid-tempo tune with the perfect Country melody, which has strong stand out instrumentals from the Fiddle, Banjo and Mandolin which help give the song an even broader Country feel. It is one of the those songs that you just want to sit back, relax and listen to over and over again. The song is very sweet with stunning, strong southern vocals from Stephanie. I can’t see it being a song that any true Country fan would dislike – mostly because it has such a great element of pure country to it that it does take you back in time slightly, which is of course, what the song is about! I would describe the song as memorable, rather than catchy, purely because there is no repetition like catchy songs seem to have. Drinking With Dolly is a perfect fit for radio and I hope it gains some airtime because I really think it deserves it and it would be nice to have a song like this on country radio. I love everything about this song and highly recommend you give it a listen. I want to see this song live at The Opry as cannot imagine a more perfect setting to see this song live for the first time. Better yet – bring it on over to the UK. I very much look forward to more music from Stephanie and am excited to hear what she will release in the coming months.